Knives have been a key fighting weapon in every war. No matter how advanced the technology, a good knife always has a place in battle. A special breed of knives saw extensive development during WWII. Known as the "fighting knife". While it could be employed for the uses of a regular knife, its primary goal was for hand-to-hand combat. The design, balance and materials employed varied from the run of the mill knife. As the war progressed bayonets began to cover the function of a fighting knife as well as that of being a bayonet. Early in the war the prevailing thought about bayonets was the bigger the better. The idea was to have a better reach and to keep the distance from the enemy. It was later realized that the long bayonets were too cumbersome. Something smaller was needed. Maneurability and control was better provided by having a smaller bayonet. 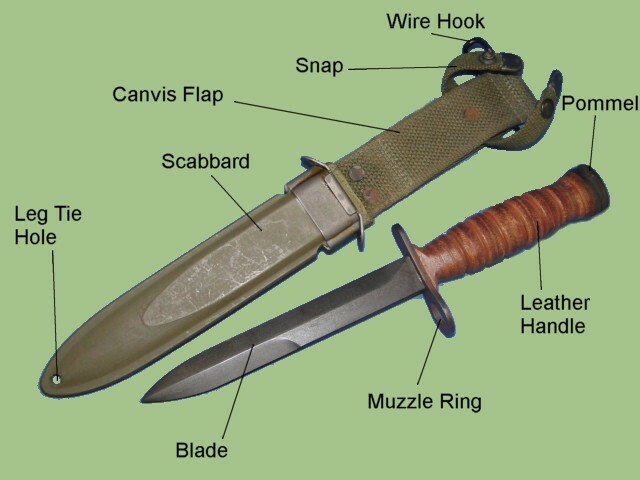 This page provides a sample of the various fighting bayonets used during WWII and beyond. The samples displayed here covers the evolution of the M-4 bayonet. The M4 bayonet was officially issued in 1944. It was designed to fit the M-1 Carbine rifle. The M-1 was used in the European and South Pacific theaters of war. The same basic bayonet was employed during the early days of the Vietnam war. The design of the knife consisted of a metal pommel with the latching mechanism. The handle is made of leather in the early versions. It had a series of ridges designed for improved griping. Later the handle was changed to a black hard plastic with heavy checkered pattern. This transition began in 1954. part of the reason for the change is that the American forces were never too keen on the use of leather. Plastic/rubber holds out much better under different conditions and over time. The blade is of single edge for about 50% of its length. The rest of it is double edge. The crossguard extended to one side with a simple oval shape, the other end had the muzzle ring. One of the places where the M4 bayonet was marked was the crossguard. Composed of an oval metal shape. Markings could be found on top or bottom of the crossguard. The photo to the left shows the top of a crossguard that has been stamped with a flaming bomb symbol. The photo on the right illustrates the bottom section of a crossguard which has been stamped with the manufacturer's logo for the Camillus company. The M-4 bayonet was manufactured by the following companies. It is not known if these are all of the companies that made the bayonet. However, this is a good number of them. This company produced the M4 bayonet during the 1960's and 1970's. The Bren-Dan company manufactured the M4 bayonet under contract for the United States Army during the Vietnam war. 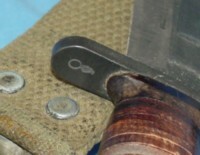 This marking is found in many of the bayonets. The Case company got its start by producing hunting knives before WWII. Once the war started they produced a large variety of high quality edge weapons. They manufactured the M4 bayonet during WWII and the Korean war. They may have also produced them during the Vietnam war. 4 Eickhorn German company that also produced daggers during WWII. The contract was probably issued as part of the effort to rebuild the German economy. The Imperial company was around for many years. It produced the M4 bayonet during WWII and beyond. The Kinfolks company had its start at the begining of the 1900's. This company produced many of the edge weapons used during WWI and WWII. 7 PAL A part of the Remington company. PAL was well known for manufacturing a series of civilian and military edge weapons. 8 S.I. Not much information is available about this company. 9 Turner Mfg Not much information is available about this company. 10 AKI Not much information is available about this company. A well known company for the manufacturing of various edge weapons. 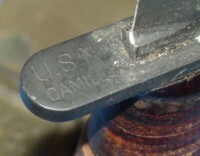 Camillus manufactured many of the M4 bayonets used during WWII and the Korean war. A producer of high quality products. This company produced the M4 bayonet and other knives during WWII. The same company also manufactured the bayonet for a period after the war. 13 Horster German company that also produced daggers during WWII. The contract was probably issued as part of the effort to rebuild the German economy. 14 Kiffe Not much information is available about this company. 15 Kongsberg Not much information is available about this company. 16 Republic of Korea The Korean armed forces adopted American weapons. Hence they were licensed to produced bayonets for the weapons. 17 TOD Not much information is available about this company. 18 Utica This company is well known for making a variety of fighting knives for quite some time. 19 K Not much information is available about this company. 20 KI Not much information is available about this company. This company produced the bayonet during the late 1970's. 22 TMN Not much information is available about this company. The pommel of the M-4 bayonet is where the latching mechanism resides. This feature allows the bayonet to be attached and detached from the M-1 rifle. Also known as the latch plate. several markings were applied to its surface. These are a couple of different photos of some of the ways in which the pommel could be marked. The photo on the left shows the letter "S" with a letter "P" across it. This indicated the manufacturer. The photo on the right shows a pommel marked with the number 210. It is not clear what this marking meant. It is possible that it was a serial or production number. M8 - This scabbard has a belt loop only. No metal hook is present. M8A1 - This scabbard comes with a belt loop and the bent wire hook. The main body was Painted green. The throat piece was enforced with a metal fitting. It is here that most of the markings are found. A canvis attachment was secured near the throat piece. This device provided the means by which the knife could be secured to a utility belt or another surface. A black metal hook was often secured at the end of the canvis strap. The tip of the scabbard has a hole where the leg tie would pass through. some of the scabbards had a metal gromet in the hole. Others did not. 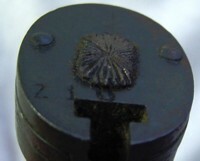 During a short period a metal fitting was applied to the tip. The following table outlines some of the companies that manufactured the scabbards. It is important to note that the companies listed here may not be all of the ones that produced the scabbards. It is possible that additional factories manufactured them. This information is brought to you by MilitaryItems.com the source for military antiques and collectibles on the web. If you have an interest is seeing other fighting knives, you can do so by going to our Military Fighting Knives Price Guide identification page. Where we cover Army, Navy, Army Air Force, USMC and other military groups. While the knives shown on this page are not for sale, you can visit our website, MilitaryItems.com , to see other military and non-military knives available for sale.